Here's a beautiful long prom dress that will show off your curves as it shimmers in the spotlight. 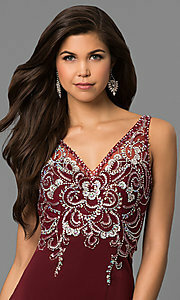 Swirls of rhinestones and sparkling beads dance across the v-neck illusion bodice for an eye-catching display. Shoulder straps transition to a contemporary beaded design that criss crosses the cut-out illusion back on this fabulous formal dress. Under $200, this budget-friendly long dress has a jersey skirt that is fitted through the hips and flares out to a lovely floor length. Available in misses and plus sizes for your prom or formal dances, this long prom dress is a dazzling find that allows you to stick to your budget. The model wearing burgundy is 5'9" and wearing 4.5" heels.